Womens Comfort PJ Set, Available in Three Colours, Black/ Pink, White/Blue & Grey. 100% Cotton. Comfort Nightwear.Big Choice in sizes .100% Cotton. Free UK Delivery. Womens Comfort PJ Set, Available in Thio Colours, Pink Camo & Grey Camo. 95% Polyester 5% Elastane. Comfort Nightwear.Big Choice in sizes .100% Cotton.Free UK Delivery. Womens Comfort Nightdress, Available in Cat , Mermaid & Unicorn Print. Comfort Nightwear Very Lightweight.Big Choice in sizes .Free UK Delivery. 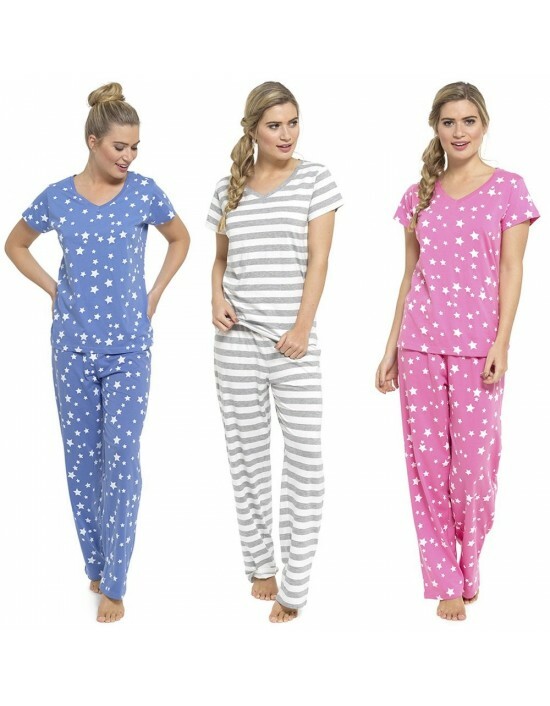 Womens Comfort PJ Set, Available in Three Colours, Blue, Pink& Grey. 100% Cotton Jersey 160gsm. Comfort Nightwear.Big Choice In Sizes . Free UK Delivery.